Happy Holidays! We hope that this issue finds you in good cheer and ready for the coming New Year. The year 2018 has been busy and rewarding for the Women’s History and Resource Center. We’ve continued to make progress on our archival project, uploaded some exciting new records to the online collection, and introduced many of you to our beautiful Headquarters for the first time. We’re looking forward to expanding our online collection in 2019 and have some exciting new projects in the works. As always, one of the joys of the WHRC is being able to read all of your wonderful WHRC Newsletter submissions. While we always love to hear about the projects you are currently working on, it is always grounding to look back at where we have come from. For this specific edition of the WHRC Newsletter we asked that you submit an article which detailed the service project that your club is most proud of or that made the greatest impact. We have been met with unbridled enthusiasm and received more submissions than we could possibly fit into a single newsletter! It has been rewarding to learn about the impact that each of you has had in your communities and the work that you dedicate yourselves to during the holidays and beyond. We hope that you enjoy this selection of projects and find inspiration for the coming year. 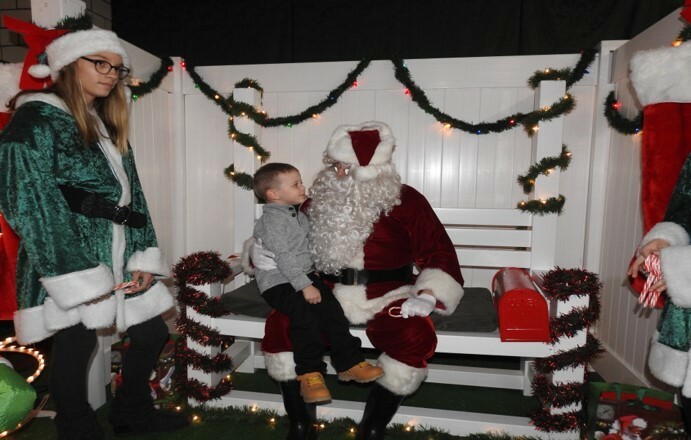 For the past 31 years, The GFWC Ohio Austintown Junior Women’s League (AJWL) has hosted the “Wickliffe Circle Tree Lighting” at Fire Station 2 in Austintown. Members of the AJWL serve cookies, candy, cocoa, and coffee to the community as children wait to see Santa arrive atop a fire truck. The children have their pictures taken with Santa and munch on treats as they listen to the Austintown Fitch High School band play Christmas music. At the end of the evening, the township trustees countdown to the lighting of the beautiful community Christmas tree. This event is a fabulous and festive way to kick off the Christmas season! When the Batesville Junior Woman’s League of Mississippi planted a small pinwheel garden four years ago in downtown Batesville, the extent in which it would impact some fellow community members was never anticipated. Prior to planting the garden, the club learned about a little girl who had been sexually abused by a family member. Her parents had been speaking out to help raise awareness for victims of assault in the community. In an effort to help the family in some small way, the club contacted the girl and extended an invitation for her to assist with planting the pinwheels. Ever since their first small garden experience, the girl and her brother have assisted in the planting all of the club’s pinwheel gardens. After revitalizing the downtown landscape, the club was eager to find to spaces to plant more pinwheels. The clubwomen aptly decided that the perfect spot would be a tire store which belonged to the Grandfather of their new friend. The club found the perfect little grassy spot next to the store and planted more pinwheels than the year before. The visibility of the new spot sparked a chain reaction. A former member called and asked to plant pinwheels at the daycare where she worked, and another member offered to plant a garden at her school with the help of the student council. The little garden was growing! The family of the club’s special friend started a program called “Listen, Believe, Support” to raise awareness of child abuse. The Batesville Junior Woman’s League supported the cause by purchasing teddy bears which were given to local law enforcement agencies, promoting the program through social media, and of course, the planting of pinwheel gardens. 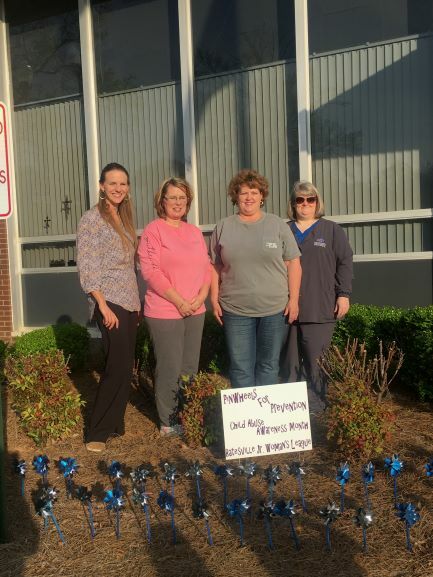 Last spring pinwheels were planted at the tire store, Batesville Junior High School, the local police department, and the daycare, and will continue to grow into 2019! From its founding, the GFWC Potpourri Glenwood club has embraced GFWC’s core principal of community service through volunteerism. One way this has been put into practice is through their involvement with the Ann Bickle Heritage Home. In 1988 the historic home was saved from demolition during a public auction. Significantly, the home was saved by women and continues to be run by women. 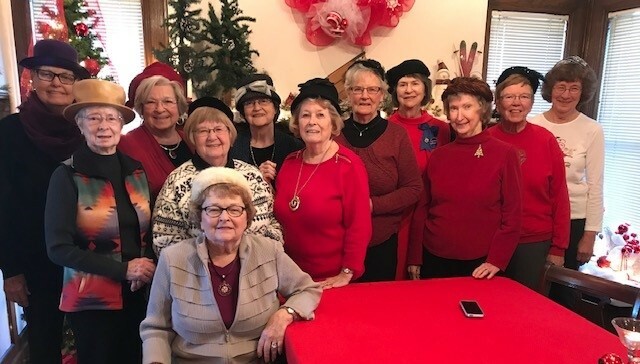 Several clubwomen from GFWC Potpourri Glenwood sat—and continue to sit—on the Home’s board and encouraged their fellow clubwomen to help with the survival of the Home. Preservation of the building, and telling the story of the woman who lived in it, has provided a wonderful model of volunteer action for the community of Glenwood. 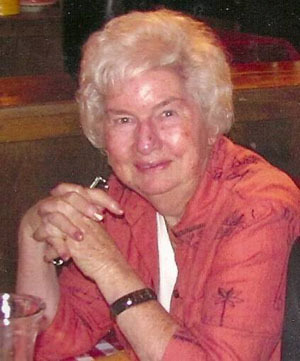 In the 1940s, Ann Bickel had identified a need for a volunteer hospital auxiliary when a new local hospital opened its doors. Ann went on to form and preside over the first Minnesota Hospital Auxiliary and helped several Midwest cities form their own auxiliaries. As a result of Ann’s historic volunteerism and its impact on Glennwood, the home was placed on the National Register of Historic Places. The Ann Bickel Heritage Home embodies volunteerism to the women of the Potpourri Glenwood Club. Clubwomen work tirelessly and creatively for funds to maintain the home. One of the most successful fundraisers is a weekly Christmas Tea held each Saturday in November. A new theme is chosen each year and board members begin decorating and preparing as early as September. After six years of hosting the teas, board members of the home turned to clubwomen to help them carry on the tradition. For the past 12 years, members of the GFWC Potpurri Glenwood Club have helped serve tea, clean up after and during the event, and even bake and provide the cookies served! For the clubwomen of Glenwood, the Bickel Home presents the opportunity to engage the community, volunteer, and teach others the importance of volunteerism. 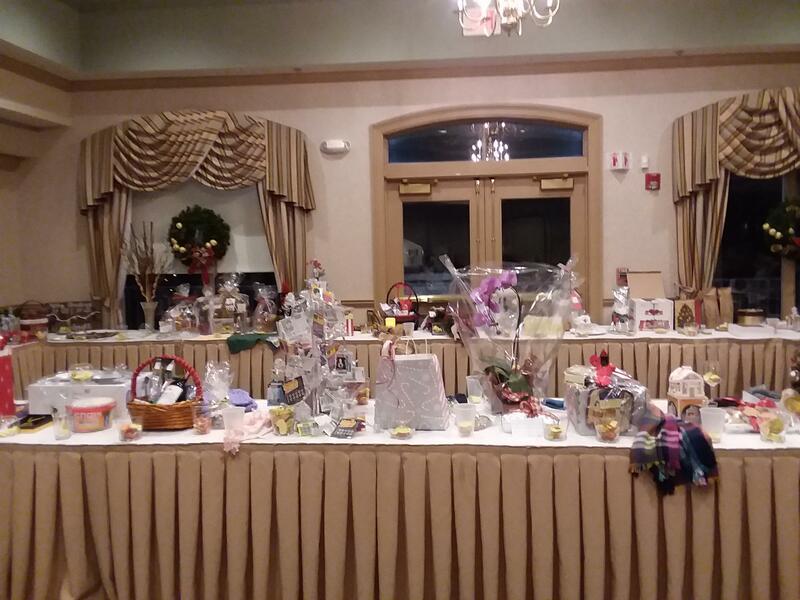 For 17 years the Women’s Club of Pittsford has celebrated the holiday season with its “Make It, Bake It, Sew It, Grow It” fundraiser. Clubwomen are asked to donate one or more items that she has made, baked, sewn or grown or to “fake it” by purchasing a food or craft gift. The items run the gambit from homemade clothing items, to sweets and baked goods, to fresh plants, wreaths, and flowers, to home goods and jewelry. There is truly something for everyone. In preparation for the event a committee works with the venue, often a local country club, to plan the meal and table decorations. An effort is made to keep the cost below $40 per person. The tablecloths, napkins and centerpieces reflect the festivity of the season, and the committee often uses pine cones and greenery from their own yards. Throughout the night, the donations are raffled off with the proceeds benefitting club operating expenses and annual grants. The raffle is turned into a wonderful evening full of clubwomen, family, and friends, and attendance typically tops 75 guests. There is always much friendly rivalry in competition for a few coveted items! The event is traditionally held on the first Thursday in December and Women’s Club of Pittsford clubwomen look forward to it year round. Although we normally have good weather, not even the occasional snow storm will deter our members from attending! GFWC Junto Woman’s Club is very proud of our long-term project to help establish and keep open a library station in the Chuckatuck area of Suffolk, Virginia. The club began in November 1924 when 12 women from the Village of Chuckatuck in then Nansemond County (now the City of Suffolk) organized a book club with the purpose of promoting a circulating library for the community. In 1926, the women broadened their scope and engaged in more civic and community minded projects. The club adopted the name “Junto,” after the literary organization founded by Benjamin Franklin in 1727. 200 years later, in May of 1927, the Junto Woman’s Club federated with the Greater Federation of Women’s Clubs. More than half a century after the club formed as a literary organization, in 1983, a board member of the Morgan Memorial Library put out a call to establish a library station in Chuckatuck, and set a goal collecting 2,000 books. Clubwoman Georgia Saunders and her husband graciously donated the needed location. The Morgan Memorial Library helped volunteers organize and catalogue more than 600 books. Among the volunteers were seven women from the Junto Club who volunteered untold hours toward the opening of the new library station. On April 26, 1983 the Chuckatuck Library opened at 2:00 p.m. with thirty-one patrons. Junto’s fifty-year-old dream of establishing a library in Chuckatuck had finally been realized. In May of 1989 the Chuckatuck Library moved out of its original location to a building that was formerly the cafeteria for the long-closed Chuckatuck School. The library was staffed by volunteers, 17 of which were clubwomen, from 1983–2011. Today, the library is able to staff full time employees. Story hours are held throughout the year and a reading program for children is offered during the summer. For the past decade, two Junto members have served on Friends of the Chuckatuck Library, one as President and one as Secretary/Treasurer. The Junto Woman’s Club also continues to offer financial contributions towards the library. The library is a wonderful asset to the community that was once served only by a bookmobile! Learn GFWC history while you help preserve it! 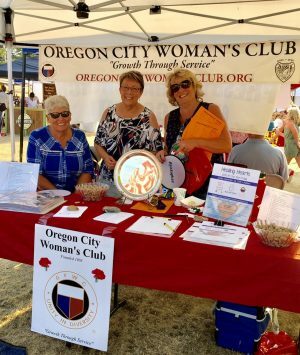 The mission of the GFWC Women’s History and Resource Center is to collect, preserve, interpret, and promote the history of the General Federation of Women’s Clubs and women volunteers. The Women’s History and Resource Center is excited to announce that it will now be opening up its quarterly newsletter to all clubwomen. 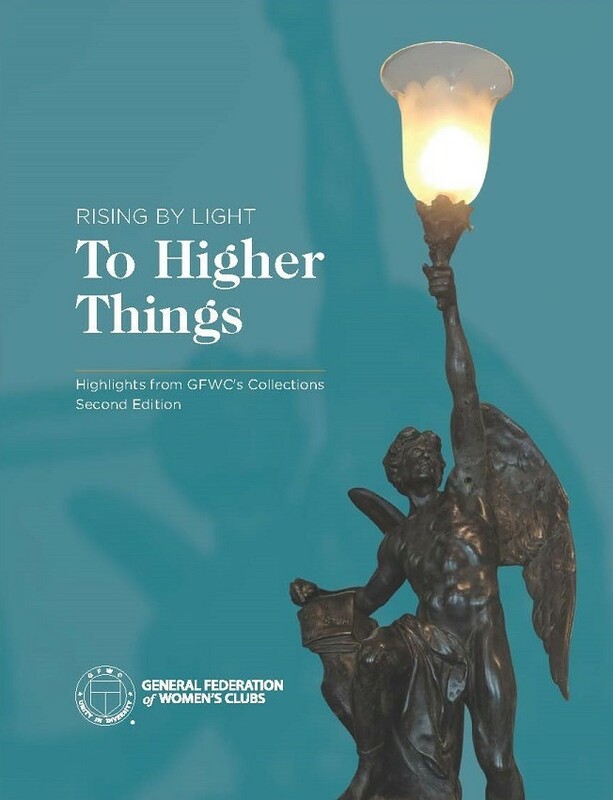 The WHRC newsletter provides an in-depth look at the celebrated history of GFWC on the national, local, and individual levels. A publication primarily written by clubwomen, the newsletter proudly publishes articles written by you and about your history. The WHRC newsletter is also the best way to stay up-to-date on the latest events and happenings in the Women’s History and Resource Center. To sign up, please visit www.gfwc.org. An enrollment box is located at the bottom on the website, underneath the News & Notes sign up. You can also sign up by providing your name, mailing address, email, and club name to GFWC Membership Coordinator Emily West at ewest@gfwc.org. Click here to make an online contribution and become a Friend of the WHRC.